Coming from a reputable company, the 3M Speedglas Welding Helmet 9100 with Extra-Large Size Auto-Darkening Filter is quite an expensive helmet at first sight, but once you get to the features and pros, you will be pleased with its professionalism. As an auto darkening welding helmet meant for professional and serious hobbyist use, it has various shades for the dark (5, 8, 9 and 13) and for the light (3) with a pretty large viewing area for the professional welder in you. The delay of the switching is also adjustable and can be widely used in different industries such as construction, automotive, fabrication, military, metal works, food and beverage, transportation, mining and others. 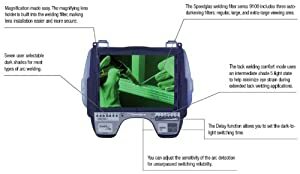 The 3M Speedglass is also unique because it not only has the auto darkening filter but also has side windows that can help save your eyes from harmful radiation and sparks. The delay of the light to dark is 0.1 milliseconds and dark to light at 40 to 250 milliseconds. 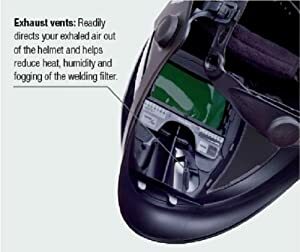 There are also exhaust vents that help to keep your helmet cool and keep the fumes away from your lungs. What is really intriguing with this helmet is that the battery life is said to be 2,000 hours approximately from 2 lithium batteries (3 volts each). The side windows and wide view really helps a lot on the welder's eyes to keep it not strained. Can be used for TIG, MIG, stick welding and others. It has a lot of adjustable straps for the welder's comfort. Large viewing area: at the size dimensions of 2.8" by 4.2", the 3M Speedglas is truly a great buy for your money and especially for professionals who want to have less strain in their eyes with a wider view of things. ​Works for a variety of welding types: it works for MIG and TIG welding, and even for beginner ones like stick or arc welding. The amperage can be easily adjustment for your different welding needs. ​Comfortable fit: with a comfortable headband and a couple of adjustable straps, you can have another member of the family or group to use this helmet without a lot of problems. Having a flexible helmet design makes it a good buy rather than buying more than one. ​Comes with accessories: there are a couple of starter lens and miscellaneous accessories that can come with the package when you buy it. Design protects eyes and face well: its extensive design allows better protection for your face and eyes and other parts of your head against the fumes and sparks. Switching not too quick: some other welding helmets tend to have a quicker switching speed than the 0.1 milliseconds of this helmet. Not for beginners: like what was mentioned above, highly-priced auto darkening welding helmets aren’t for practice work, beginners and students. Go for a cheaper helmet instead if you are not too meticulous about details and comfort. The 3M Speedglas is pretty much intended for professionals and serious hobbyists only. Expensive lenses: it might take you a lot of effort and time in searching for a better deal with lenses if they break down. Both the helmet and the lenses that you have to buy separately are quite expensive. This helmet is a "one size fits most" because of its easy adjustable straps and control knobs that can even work while wearing safety gloves. The item is of the color black. ​The said switching time of the auto darkening helmet is only applicable for more than 23 degrees C (73 degrees F) of temperature. A starter lens kit can come with this package if you order it. 1.Q: Is the 3M Speedglas the one with the Side Window? A: Yes, it has side windows and covers for protection. 2.Q: On what size can the helmet best fit on? A: It can fit on around 50 - 64 centimeters (6.25 - 8). 3.Q: Can any shade preset in the helmet be locked in? A: Yes, the 3M Speedglas has a lock-in feature to help keep your eyes from being tired. 4.Q: How long does the battery last? A: The battery life of the 3M Speedglas welding helmet can approximately last for 2,000 hours, with replaceable batteries. 5.Q: Which types of welding can this helmet be best used on? A: It works well with stick or arc welding, TIG and MIG welding. 6.Q: What is the size of the auto darkening filter? A: The size is 11.75 to 12.25. 3M has been a long trusted brand with the industrial applications and safety gear, so for the Auto-Darkening Filter 9100XX, you will definitely get the best out of your money if you really intend it for professional and serious use. You can also get this helmet on discount on some shops or by using coupons if you really want to save up. If you really want to enhance the experience, you may also purchase related accessories such as the 3M Speedglas Starter Kit 9100XX which contains additional lenses and such. Looking for another best product on 3M Speedglas please check ﻿﻿3M Speedglas Black Welding Helmet 9100﻿ Review for reviews and make your choice.